The president’s position on NFL players who protest remains unchanged. Trump made that clear in a pair of early Friday tweets, the morning after pro-football players were seen taking a knee or raising a fist during at least two NFL preseason games. President Trump followed up with a second tweet, saying, “…..Be happy, be cool! A football game, that fans are paying soooo much money to watch and enjoy, is no place to protest. Most of that money goes to the players anyway. Find another way to protest. Stand proudly for your National Anthem or be Suspended Without Pay! At the game Thursday night between the Miami Dolphins and the Tampa Bay Buccaneers, Dolphins wide receivers Kenny Stills and Albert Wilson knelt, while defensive end Robert Quinn stood with his fist raised. The players’ protests came just one day after the team submitted a nine-page disciplinary document to the NFL that discussed possible punishments for anthem protests, including fines or suspensions. Colin Kaepernick, who spearheaded the movement among players, later tweeted in support of Stills and Wilson. My brother @kstills continued his protest of systemic oppression tonight by taking a knee. Albert Wilson @iThinkIsee12 joined him in protest. Stay strong brothers!✊???? Philadelphia Eagles defensive back Malcolm Jenkins and cornerback De’Vante Bausby both raised their fists, according to the Philadelphia Inquirer. Other players opted to remain off the field while the anthem was played, according to multiple reports. 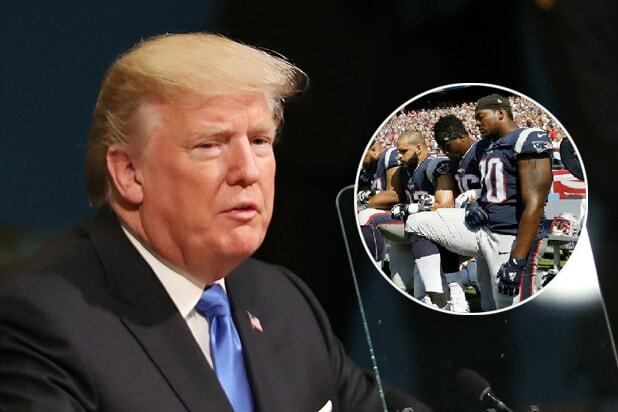 Trump launched into a tirade last fall, criticizing players, for multiple days straight, for taking a knee during the national anthem, tweeting, in part, about the “great anger” Americans feel about the issue. He also repeated a call for the NFL to issue a rule barring such protests — something that team owners had rejected at the time.